Albert Einstein, a German-born physicist, is best known for his famous equation, which has been dubbed as ‘the world’s most famous equation’ – “E=mc2.” Albert Einstein was not very satisfied with Newtonian mechanics, as he thought that these theories were not enough to explain classical mechanics and the electromagnetic field. And this inspired him to develop his singular Theory of Relativity. 1. 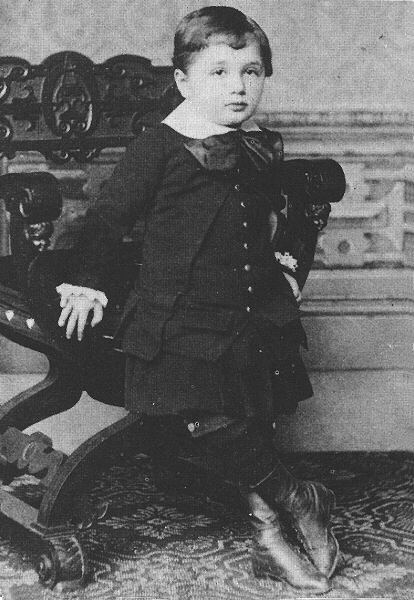 Born: Albert Einstein was born in Ulm, Germany to parents Hermann Einstein and Pauline Einstein. At age 29, his father married Pauline Koch. She was eleven years his junior. He was born at 11:30 am on Friday, March 14, 1879. His parents had planned to name the boy Abraham, after his paternal grandfather. But they thought that the name felt “too Jewish” and ended up naming him Albert. 2. Fathead at birth: Albert had a fat head at the time he was born. This startled his mother and grandmother when they saw him for the first time. However, the fat head slowly receded and turned into a normal size. Interestingly, a head containing the brain that would inspire millions of people in the future was not so perfect at birth. 3. Speech difficulty during childhood: Einstein did not speak until the age of three. He revealed this fact about the delay of his speech abilities to his biographer. Today there is a term, “Einstein Syndrome,” which was coined by Dr. Thomas Sowell, to describe exceptionally bright people whose speech is delayed. 7. Why he was different? His success is attributed by many to his unconventional approach to learning, challenging authority and obsessing him with mysteries that others did not find amusing. Einstein insisted on the importance of individuality. 8. A symptom of psychiatric disorder: Einstein, throughout his life, had a mild form of echolalia, which caused him to repeat phrases to himself, two or three times, especially if he liked them. He liked to think in pictures, an important tactic of some of the world’s most renowned thinkers and scientists including Nikola Tesla. 9. The parietal lobe in Einstein’s brain was 15% larger than that of an average brain. An Albert Einstein statue in central Washington, D.C., United States. Image by David. 11. His favorite scientist: Galileo Galilei was Einstein’s favorite scientist. 12. Did you know that Sir Isaac Newton was born the year Galileo Galilei died and Einstein was born the year that Maxwell died? 13. Not suitable for employment: his teachers did not consider him a good student, and they refused to recommend him for further employment. 14. Failure at 16: at 16, Einstein is said to have failed an exam that would have let him train to become an electrical engineer. 15. Did you know that Einstein wrote his first essay on theoretical physics at the age of 16, which he titled “on the Investigation of the State of the Ether in a Magnetic Field.”? 16. Forgetfulness was a big part of his personality since his childhood days. He would often leave behind his suitcase and could not keep track of his keys. 17. Citizenships: Einstein was born German and a Jew. Einstein renounced his German citizenship in 1896. He became a Swiss citizen in 1901. However, he died in 1955 as an American citizen. 19. Could not swim: Albert Einstein never learned to swim. However, he loved sailing and continued to do so as a hobby throughout his life. Also, Einstein never wore socks. He thought wearing socks was a pain, and he would often get holes in them. 20. An Avid Smoker: Einstein’s love for smoking was so enormous that he credited his pipe smoking with a calming and judgmental effect. The technique to visualize things and experiments helped him a great deal. 21. Invented refrigerator: Amazingly, Einstein also co-invented a refrigerator that would work on compressed gases. Einstein is also considered to be the man behind the inventions such as – the photoelectric cells, lasers, nuclear power, and fiber optics and even semiconductors. 22. Einstein had trouble getting an academic job. Interestingly, it took him 9 years before he could finally land at his first job after graduation from the Zurich Polytechnic in 1900. 23. Einstein got second time appointed as a Technical Expert Class 3 of the Federal Office for Intellectual Property. There he was paid 3,500 Franks annually and he had to work for eight hours every day, six days a week. He enjoyed his work to the core, which involved examining patent applications. After a few days of service, he realized that he could do the whole days work in just a few hours and thus he utilized the remaining free time at the office to do his scientific work and thinking. 24. At the age of 30, in 1909, he moved to Zurich and got appointed as a junior professor at the University of Zurich. Einstein had a distinct style of teaching. He used cards instead of papers for preparing notes and he would also note down his ideas during the lectures. Moreover, he allowed his students to interrupt him; he would also stop and ask his students if they were following him. This interaction between the teacher and the pupils was unique at the time. 25. When Einstein received his doctorate, he was promoted from a third class to a second class technical expert at the patent office and his salary was raised to 4,500 Francs a year. 26. Einstein became one of the most famous faces on the planet when his prediction that gravity bends light was confirmed during an eclipse in 1919. 28. Another interesting fact about Albert Einstein is that he had a poor memory. He could not remember names, dates or phone numbers. 30. Love and Hate: he loved the violin and sailing, and hated socks and haircuts. He #also loved bird watching. 31. Einstein made groundbreaking discoveries during the earlier years of his life. While he continued to perform research, he did not produce anything of significance during the later years of his life. 34. Illegitimate daughter: Einstein had an illegitimate child with fellow student Mileva Maric, who later became his first wife (1903-1919). Their child is believed to have died in 1903 because of an infection just one year after her birth. 35. The second child from his first marriage with Mileva Maric was born on May 14, 1904. The couple named him Hans. His wife’s father when came to visit the couple to bless the newborn is reported to have offered Einstein a sizeable dowry of 100,000 Franks, which Einstein politely denied.